Re-creating Noah's Ark, with lizards, for science! After a hurricane wiped out all the lizard species on certain islands in the Bahamas, scientists re-populated the small islands with two lizards of each kind. They then sat back and watched how those lizards evolved to get an up-close look at the Founder Effect. Four years ago, a hurricane swept across islands near Great Abaco, in the Bahamas. The local lizard populations were, on many small islands, swept away entirely. In came a team of scientists from Harvard, Duke, the University of California at Davis, and the University of Rhode Island. They grabbed brown anole lizards from a heavily forested island that had an intact population, and took them across the ocean, in a boat, to deposit two of each kind on small islands in the area. (Yes, the Bible has seven or eleven or some other prime number of each kind. Give them some scientifo-poetic license.) The islands that they put the lizards on were mostly planted with scrub bushes and grasses. 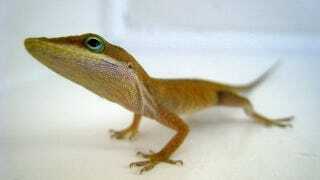 Brown anole lizards can live in both, but they do specialize according to body type. The lizards with long legs make their way through trees best. Shorter-legged lizards do better in bushes close to the ground. By moving the lizards from a mostly-forested island to mostly-scrub islands, the scientists wanted a chance to observe the Founder Effect. Although evolution, over time, can produce extreme diversity, it is always hampered by what came before. Animals can only diverge from what they have. The Founder Effect is the degree to which 'what they have,' influences them. If there is a large population of lizards on an island, then they have a large degree of genetic diversity to diverge from, even within the same species. If there's just a pair, then the genetic legacy of that pair will be carried down through generations, since the subsequent lizards don't have any other genetic variation to draw on. Obviously, this is tough to test in everyday life, unless you Noah a pair of lizards onto an island, and observe their characteristics over the next few generations. Jason Kolbe, the director of the research, was pleased to see that the lizard pairs all survived to make icky incestuous lizard babies over the next few years. The populations increased, on each of the small islands, for two years before leveling off. Scientists went in regularly, counted the population, and took a look at the average leg length. "We noticed a founder effect one year after starting the experiment, which resulted in differences among the lizards on the seven islands," Kolbe said. "Some of the islands had lizards with longer limbs and some had lizards with shorter limbs, but that was random with respect to the vegetation on the new islands." "Over the next four years, the lizards on all the islands experienced a decrease in leg length that is attributable to natural selection. But those that started out with the longest hind limbs still had the longest hind limbs. The fact that the populations maintained their order from longest to shortest limbs throughout the experiment means that both founder effects and natural selection contributed to their current differences." The Founder Effect was observable generations down the line, even in such trivialities of a few millimeters of leg. Try as you might, there's no getting completely away from your ancestors.